Do we have to setup all 3n equations for the n quadratic splines for (n+1) data points? QUESTION ASKED BY STUDENT: For linear splines, we still find each line individually. In quadratic, we are forced to find every equation at once, correct? Which is where the matrix comes from? ANSWER: That sounds right, but one can find quadratic equations individually also . If the first spline is linear, then that spline can be found by the two points it goes through. Then the second spline goes thru two points, and that gives two equations. The slope of the second spline is same as the slope of first spline at the common interior point, and the first spline is known. This gives the third eqn. This process can be repeated for each following spline. Author Autar KawPosted on 24 Mar 2012 24 Mar 2012 Categories Interpolation, Numerical MethodsTags Interpolation, quadratic spline interpolation, spline interpolationLeave a comment on Do we have to setup all 3n equations for the n quadratic splines for (n+1) data points? The motivation behind the experiment is to understand spline interpolation and numerical integration by finding the volume of water that can be held by a champagne glass. The student chooses one of the odd-shaped champagne glasses (Figure 1). The student measures the outer radius of the champagne glass at different known locations along the height. The student measures the thickness of the glass, so that he/she will be able to find the inner radius of the champagne glass at the locations he/she measured the outer radius. The student pours water to the brim in the champagne glass and checks how much volume the champagne glass holds. Use MATLAB to solve problems. Use comments, display commands and fprintf statements, sensible variable names and units to explain your work. Staple all the work in the following sequence. Use USCS system of units throughout. Attach the data sheet on which you collected the data in class. 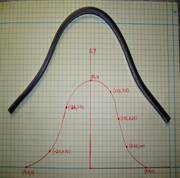 Find the spline interpolant that curve fits the radius vs height data. Show the individual points and the spline interpolant of radius vs height on a single plot. Find how much volume of water the champagne glass would hold. Compare the above result from problem#4 to the actual volume. What materials do you need; where do I buy it; how much do the materials costs? Champagne Glasses: These glasses, called the Hurricane Plastic Glasses, are available at www.poolsidepineapple.com, part nos. HUR-105, HUR-106, YAR-114. We used glasses made of plastic to avoid breakage. http:/www.poolsidepineapple.com/cart_pages/shopping%20page%20tropical.htm. You can try other places to buy the champagne glasses. About $40 or so for about six pieces including S&H. Better yet, go to a cruise and get souvenir glasses. Whenever you do the experiment, you will remember the good times. 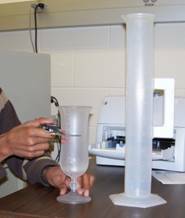 Graduated Cylinder: The graduated cylinder is available at http://scientificsonline.com/, part number 3036286. The cost of the cylinder is $20+S&H. Vernier Caliper: The caliper is available at http://mcmaster.com part number 20265A49. The cost of the vernier caliper is $60+S&H. Scale: Need to buy a thin scale for this. Any art-supplies store for $2 or so. High order interpolation is a bad idea? One would intuitively assume that if one was given 100 data points of data, it would be most accurate to interpolate the 100 data points to a 99th order polynomial. More the merrier: is that not the motto. But I am sorry to burst your bubble – high order interpolation is generally a bad idea. The classic example (dating as back as 1901 before there were calculators) to show that higher order interpolation idea is a bad idea comes from the famous German mathematician Carl Runge. He took a simple and smooth function, f(x) = 1/(1+25x^2) in the domain [-1,1]. He chose equidisant x-data points on the function f(x) in the domain xε[-1,1]. Then he used those data points to draw a polynomial interpolant. For example, if I chose 6 data points equidistantly spaced on [-1,1], those are (-1, 0.038462), (-0.6, 0.1), (-0.2,0.5), (0.2,0.5), (0.6,0.1), and (1,0.038462). I can interpolate these 6 data points by a 5th order polynomial. 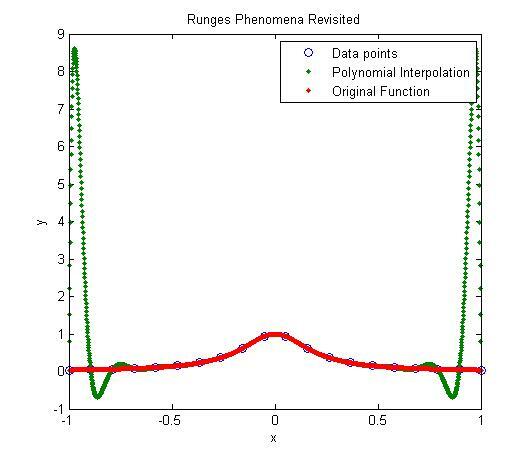 In Figure 1, I am then plotting the fifth order polynomial and the original function. 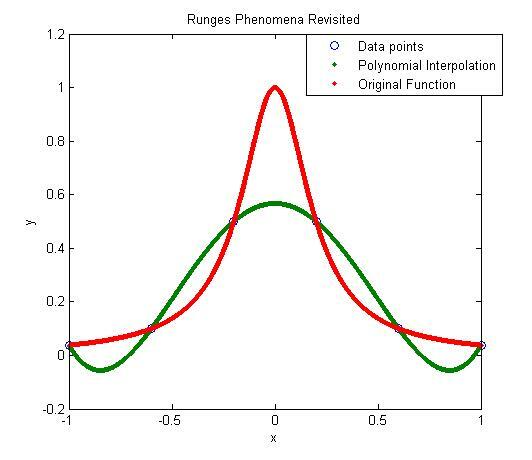 You can observe that there is a large difference between the original function and the polynomial interpolant. The polynomial does go through the six points, but at many other points it does not even come close to the original function. Just look at x= 0.85, the value of the function is 0.052459, but the fifth order polynomial gives you a value of -0.055762, a whopping 206.30 % error; also note the opposite sign. Figure 1. 5th order polynomial interpolation with six equidistant points. Maybe I am not taking enough data points. Six points may be too small a number to approximate the function. Ok! Let’s get crazy. How about 20 points? That will give us a 19th order polynomial. I will choose 20 points equidistantly in [-1,1]. It is not any better though it did do a better job of approximating the function except near the ends. At the ends, it is worse than before. At our chosen point, x= 0.85, the value of the function is 0.052459, while we get -0.62944 from the 19th order polynomial, and that is a big whopper error of 1299.9 %. So are you convinced that higher order interpolation is a bad idea? Try an example by yourself: step function y=-1, -1<x<0 and y=+1, 0<x<1. What is the alternative to higher order interpolation? Is it lower order interpolation, but does that not use data only from less points than are given. How can we use lower order polynomials and at the same time use information from all the given data points. The answer to that question is SPLINE interpolation. Author Autar KawPosted on 14 Jun 2008 14 Jun 2008 Categories Interpolation, Numerical Methods, UncategorizedTags Interpolation, runge, spline interpolation6 Comments on High order interpolation is a bad idea?